In recent years, front loading washing machines have become more popular due to their convenience and ease of use. Not only are they better with water conservation, front loading washing machines have effective drying abilities which makes them the perfect household equipment. 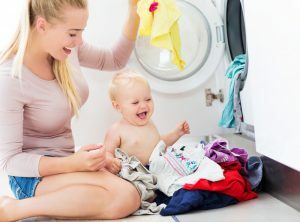 In this article, we will introduce to you the latest front loading washing machine models and compare them based on their price, features, reviews, etc. so that you can choose the best suited product for yourself. We will also point out a few important factors to consider so that you can choose the best suited front loading washing machine. You will find several front loading washing machines on the market which come with different features and functions and can be really helpful in doing laundry. Here are a few recommended points to consider when choosing the best front loading washing machine for yourself. The first thing that you need to choose is the capacity of your front loading washing machine. 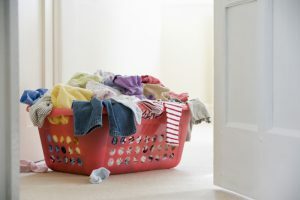 On an average, each home has 1.5-2.5 kg of laundry every day. If you wash your family’s laundry every day, you don’t have to worry about the size of washing machines because most of the washing machines on the market have over 5 kg capacity. However, if you are busy weekdays and would be washing your clothes only on weekends then you might need to consider a larger capacity washing machine to wash all your clothes, blankets, sheets and bed covers all together. 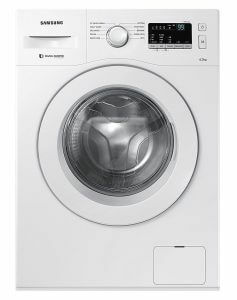 Unlike a top loading washing machine, a front loading washing machine includes an entry door which needs to be opened to load and unload your laundry. Generally, a washing machine comes with a door which is opened on the right side so make sure it is easy and convenient for you to access your laundry. Maintain sufficient distance between the wall and your washing machine door so that you can open and close it with ease. Most of the time, a washing machine is stored in the bathroom or the laundry room which is why it is important that we place the washing machine in such a way that it doesn’t block the bathroom door. Also, make sure that there is some place on the right-hand side of the washing machine to conveniently take out the laundry once it is done. 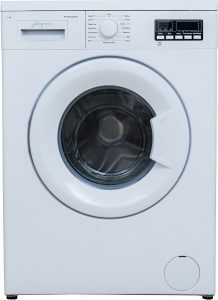 People who live in apartments or who have small children at home need to consider a washing machine which will make as little sound as possible. So, look for a washing machine which produces 45 dB (decibel) or lower, which is usually considered as a quiet washing machine. Another thing to keep in mind is that the amount of noise changes when your washing machine is rising, draining or drying so make sure that you check the noise levels for all these three tasks before purchasing the washing machine for yourself. A front loading washing machine can easily fit your children and pets inside it, which is why it is important that you check the child lock feature on the washing machine beforehand. We all know that children are naturally curious, so it is important that you keep an eye on them when you are using your washing machine. Since the front loading machine can only be opened from the outside, it is important that you choose a safe and secure washing machine that will keep your children protected too. Choose a washing machine with a child lock feature so that you don’t have to worry about your children every day when you are using the washing machine. In comparison to top loading washing machines, front loading washing machines can help in water conservation as it comes with features that ensure that the amount of water inside the water tub is adequate for the amount of load. 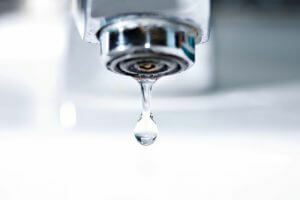 Most of the manufacturers provide with the same amount of water conservation in their front loading washing machines so you can choose any manufacturer. However, you need to pay careful attention to the amount of electricity used by the washing machines as it varies from product to product. The electricity bill depends on the drying feature of your washing machine. If your washing machine features a high spin speed then you will find no need to use a separate dryer to dry your laundry. This will help you in saving both money and electricity and will also make it easy for you to dry your clothes in a reduced amount of time. 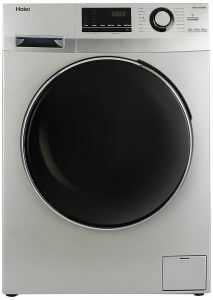 Here are our top 10 recommended Front Loading Washing Machines which you should consider to buy. This Haier washing machine offers fast spin and rinse washing options to the user for a quick wash and dry. Also, this washing machine can work with any water pressure, with something as low pressure as 0.001 – 0.002 MPA which makes it quite convenient to use. The dispenser and gasket of the machine are built with anti-bacterial material so as to remove at least 99.8% of germs and bacteria and provide you with a clean and healthy washing. However, since this machine produces 56-75 dB sound, it is often considered loud and not convenient for houses with small children. Overall this is a good product for couples and families which don’t have any small children at home. Another great product that features crescent moon shaped texture inside the washing drum for gentle washing and protects your laundry from any kind of damage. It also includes a ball in its valve which helps in the water drainage while reducing the wastage of the laundry detergent. It offers 15 wash programs to the users and its stainless steel tub can easily withstand the high spin setting as well which makes it both efficient and durable. This washing machine also allows the users to add more clothes even once the wash cycle has started which makes it extremely convenient to use. However, the wash cycle of this product often takes a lot of time which makes it a good choice for those who aren’t in a hurry to wash their clothes. This is one of the most affordable products in the market. The wide opening door of the washing machine makes it easy to load and unload the laundry. Its inbuilt water heater helps in heating water quickly and efficiently. Warm water easily cleans oily dirt, so if you have small children who often make oily stains on their clothes when they are eating, why don’t you try it? Since this machine generally comes with castor wheels, even if you are living alone or you don’t have so much power, you can easily move it around. However, with its low laundry capacity, it is not advisable for those who are going to wash their laundries only on weekends. 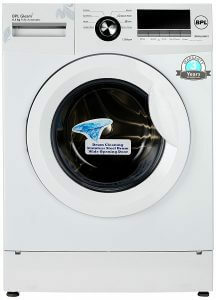 This machine includes diamond-shaped holes inside the washing drum which protects your clothes from getting damaged while being washed. It features an anti-vibration design which reduces the vibration produced by the machine and makes it more stable and sturdy and less likely to cause damage during a wash cycle. It includes an LED display which makes it easier to use and the self-cleaning tub mode makes it easy to keep your machine clean and free of mold but it is quite expensive compared to other similar products in the market. However, its child lock and auto power off feature make it worthy of the high price and makes it perfect for office going people as they don’t have to worry about leaving their washing machine turned on every time they leave the house. Yet another great product which offers users 15 wash programs while reducing the creases in the laundry when washing and it manages the foam amount to protect your laundry from any damage. It not only removes the stains from your clothes but also gets rid of allergens and germs as well and manages the water and energy consumption depending on the laundry load to reduce the energy and water wastage. It also comes with a child lock feature to protect your children from locking themselves inside the machine. Since it reduces the water and energy consumption while effectively cleaning their clothes, it is an ideal choice for the environmental-conscious households. 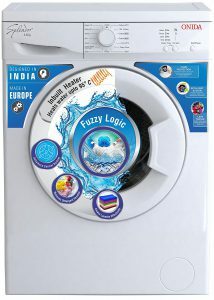 This IFB washing machine offers 100 washing programs to the users which make washing laundry easy and fun while its rat mesh prevents rodents from climbing inside the washing machine and add bad odor to the washed laundry. It also comes with an option of cleaning the washing machine tub which makes it easier for users to keep their machine free of germs and bad-odor. Its laundry add feature makes it easy to add more clothes after the wash cycle has started. Since it comes with a child lock and numerous washing programs, it is best-suited for families with small children. However, all programs of this machine take more than 1.5 hours, so this product might not be for you if you need a quick wash. This washing machine uses a high-grade motor made out of copper for an effective and powerful wash every time. 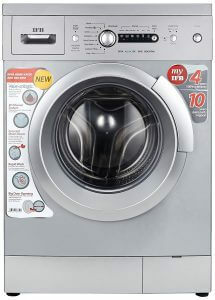 It also includes an inbuilt heater for a quick hot wash and offers users with different wash programs to choose from. Its 180 degrees swing door makes it easy for loading and unloading of laundry while the program selector knob along with easy-to-read digital LED display makes it easier to use. It barely produces a sound at 35-65 decibels which makes it an excellent product for families with small children as it won’t disturb their sleep while washing your laundry effectively. One of the best washing machines in the market which helps in water and electricity conservation while reducing your electricity bill by a great margin. It also uses hot water to remove the detergent residue and bacteria inside the water drum and helps in prolonging the washing machine’s life. It comes with a Super 30′ Program which allows the users to quickly wash their 2kg laundry in just 30 minutes and comes at a reasonable price which makes it popular among users. This front loading washing machine is an excellent choice for singles and couples who have a daily office and want a short and quick wash every day to keep their clothes fresh and clean. The LG washing machine features a direct drive technology which reduces the electricity consumption while keeping a check on the noise and vibration produced by the machine and improves the performance and durability of the product. This product also features an anti-rat cover which helps in protecting your machine from rodents and a tub clean feature makes it easy to clean and maintain your washing machine. 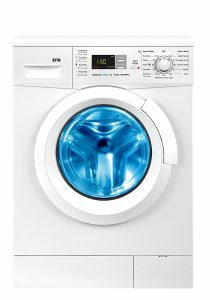 It offers 4 spin settings to the user and includes 6 different wash programs to clean different fabrics like cotton, wool, etc. Also, its smart diagnosis system allows the users to troubleshoot their machine which makes it the ideal product for those who want an easy and convenient washing machine. One of the top washing machines in the market that includes a preset feature to clean Indian sari gently yet effectively and allows the users to load and unload the laundry in the middle of a wash cycle which adds more convenience to the washing process. This product also gives you perfect wash even if you live in an area of soft water which gives more lathering than hard water. It increases the water level while washing clothes so that all the detergent is removed from the clothes when soft water is being used in the machine. 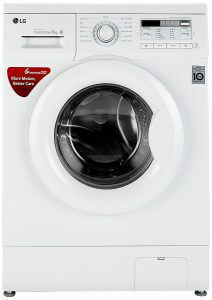 It features different quick wash options which help in reducing the wash time and allow you to quickly wash around 2 kg of laundry in just 15 or 30 minutes, depending on the selected washing option. 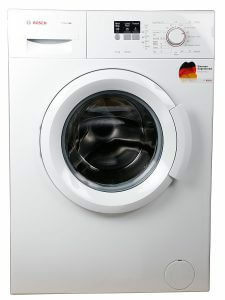 It is an excellent washing machine for people who want a quick laundry wash every day. A front loading washing machine is easy and convenient to use and also helps in conserving a lot of water and electricity which is why it has become so popular these days. 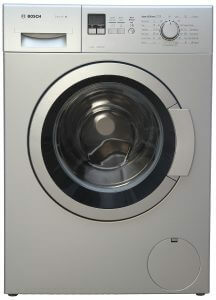 With the help of our guide, you will be able to choose the best suited washing machine for yourself in no time at all. Make sure that you check all the above-mentioned points when choosing a washing machine and always look for a water saving and less energy consuming product for the best results.